Avengers Assemble was arguably one of the best superhero movies of recent times; perhaps equalling the Watchmen in quality and entertainment. It was a massive box office hit which brought together a number of Marvel’s superheroes who have to work together against a common cause under the watchful eye of Nick Fury. 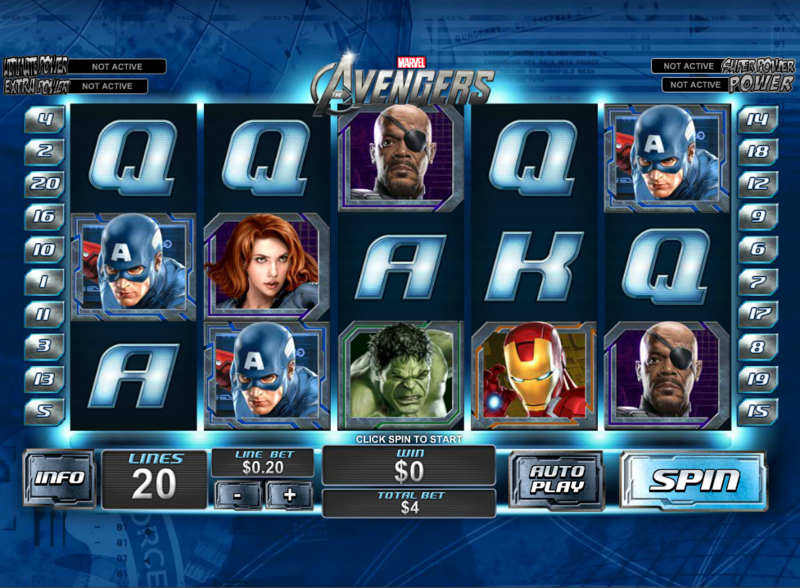 Avengers is one of Playtech’s Marvel slots and it’s a glossy, five reel and twenty fixed payline game which adheres to Playtech’s successful formula for this series of machines. The low value symbols are the Q, K and A and then, in increasing value, we have Hawkeye, Black Widow, Nick Fury, Hulk, Thor, Iron Man and Captain America. The wild symbol is Nick Fury’s S.H.I.E.L.D. logo while the scatter is the Marvel Avengers logo. If you can land Captain America, Iron Man, Thor, Hulk and Nick Fury on consecutive reels on an active payline you’ll win 200x the line bet. Captain America – a random multiplier between 1 – 5 is awarded on each spin. Iron Man – you start with a 1x multiplier which increases by one every three spins. An extra wild is also added to the middle of the third reel. Thor – Thor adds between 1 and 5 extra wilds to the reels after the spin has stopped. Hulk – Hulk is stacked on reel three meaning he covers all reels and acts as a wild, creating even more winning combos. 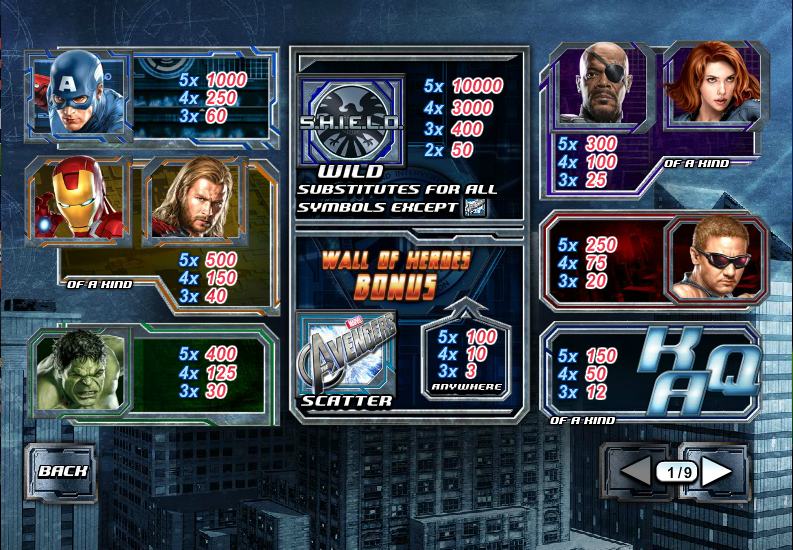 When the spins have finished you return to the Wall of Heroes for another shot at some more free spins. Everyone playing Playtech‘s Marvel slots are in with a random chance of triggering one of the following progressive jackpots – Power, Extra Power, Super Power and Ultimate Power – but the higher your stakes, the better chance you have. Avengers is an extremely polished and entertaining game and it’s noticeable that the characters on the symbols look exactly like the actors involved. The paylines are fixed so there’s a minimum stake of £0.20 and a maximum of £500. If you’re feeling lazy there’s an Autoplay feature which won’t stop until you trigger a feature.